Each Pacific Northwest Carry bag is unique. Using natural elements of wool, leather, cotton duck, copper rivets , driftwood and found treasure each Pacific Northwest Carry Bag is a one of a kind creation. Built to last, these bags are roomy with many pocket compartments, rugged, and beautiful! In addition, up cycling materials are used when available such as sturdy leather belts or horse tack for straps, found wool rugs or kilims for the body of the bag, found treasure for decoration. The textures, colors and beauty of the Pacific Northwest are what drive the creation of each Pacific Northwest Bag. While the bag is ideal for carrying art supplies, study materials, travel items, most any bag can be adapted to carry your private protection device. Ron, at Tillamook Boot Repair, does the expert rivet installation as well as the heavy duty stitching when needed. Vancouver Recycled Arts Festival, June 29 and 30th, Esther Short Park CONFIRMED Bags made from upcycled materials (75%) only will be featured at this show. 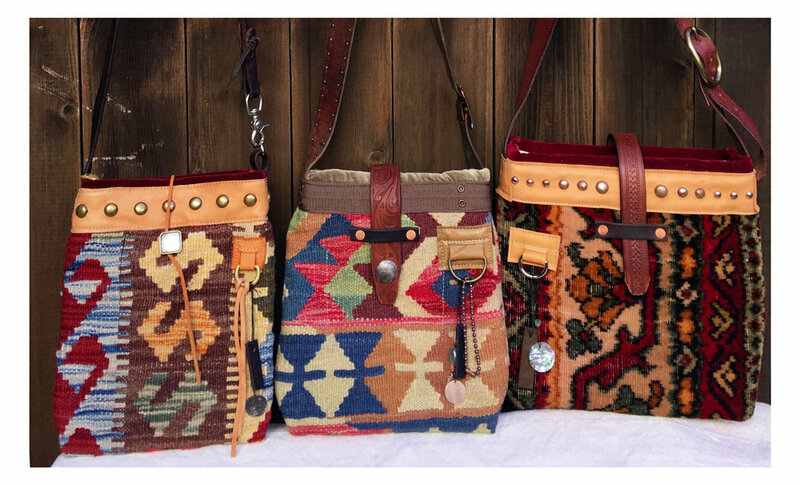 Dancing Buffalo Trunk Show featuring bags from “The Pony Collection" Virginia City Montana, August 2. 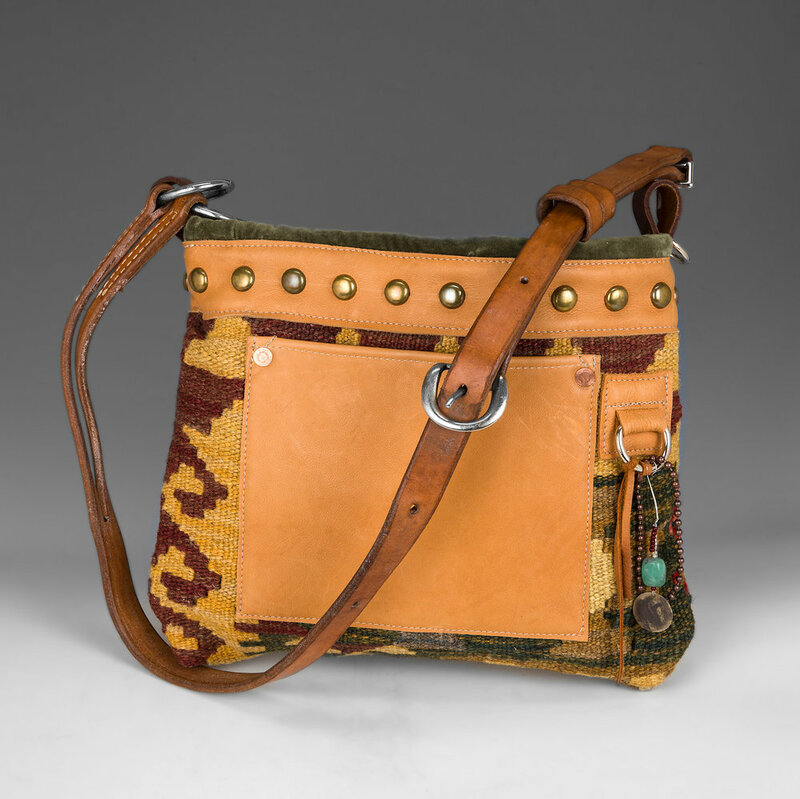 The Pony Collection is a large selection of bags made from an vintage wool carpet rescued by Annie of the Dancing Buffalo Gallery from a heritage home in Pony Montana. Look for the Rexville Grange Arts event in November!! The Overnighter. This is a LARGE bag big enough for overnight adventures. 15"X24". Large organizing pocket and leather pocket for pen/credit card inside. Vintage wool Kilim outside, 100% cotton duck lining. Sturdy, upcycled leather belt strap with solid brass hardware, copper rivets at stress points. 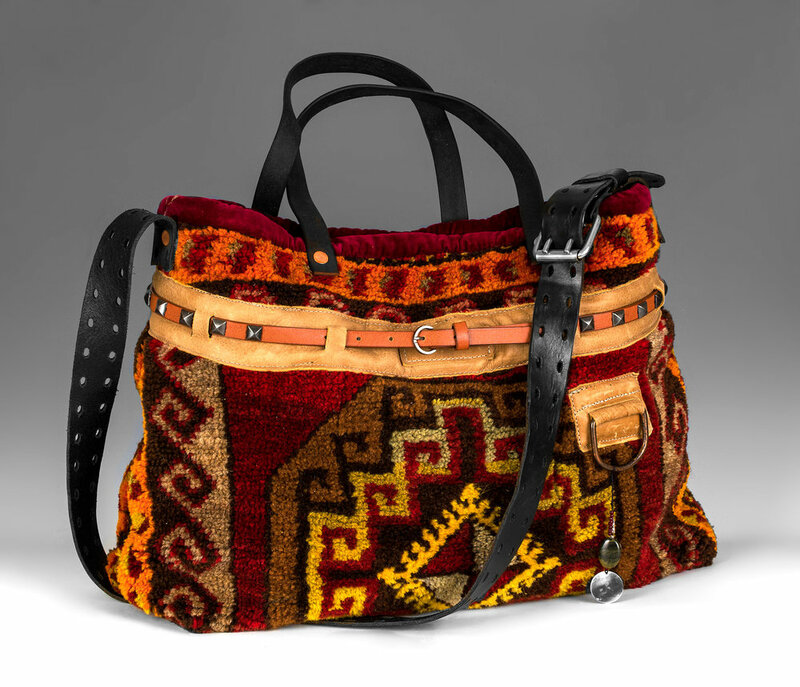 Large Overnighter bag made from Vintage Wool Kilim and leather. Ample organizing pockets and leather pen/credit card pocket. Small Bucket Bag. This is a smaller version of the LARGE Portfolio. 10"X12". Sturdy leather rein for strapping with decorative tack. Organizing pockets and leather pocket for pen/credit card.